At Mobile Bingo Bonuses we’ve got a bit of a sweet tooth, so when we found out there was a new candy related slot game about to hit our screens we were ecstatic, So Much Candy Slots is a brand new slot release from gaming giant Microgaming, and form part of the hugely successful So Much range of games. We’ll take you to the candy shop, where one taste of we’ve got, will have you spinning until you win the lot. 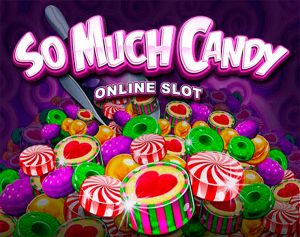 So Much Candy Slots will surely please fans of the mighty slot with its sugar filled goodies, thanks to the superior quality of Microgaming’s graphics, the colourful candy is so realistic you will be forgiven for being tempted to reach in and have a bite. So Much Candy is designed in 5 reel 25 pay lines with a layout that will take you into a candy shop filled with bright sugary treats. As you would expect from the name, So Much Candy has a theme of a variety of candies, using bright and colourful symbols that will leave you with a sweet taste of success when they all line up for the mega money jackpot. As with most slot games you can adjust amount you want to bet per line and how many lines you want bet with, then you have the option to select autoplay, where the reels will spin automatically for a set number of spins so you can just sit back and relax while your winnings come in, or you can choose to control the pace of your game by selecting to spin yourself. The So Much Candy logo acts as the wild symbol, which can replace any other symbol on the reels with the exception of the scatter symbol, get 3 or more candy symbols in a winning combination and you will triggers the Much More Candy Feature, where you can enjoy an increased number of winning combinations thanks to the high symbols which can split up to 5, Split symbols during this round can award up to 25 Symbol wins. Another symbol to watch out for is The Candy dispenser which acts as the scatter symbol on So Much Candy Slots, get 3, 4 or 5 candy dispensers and you have just unlocked the lucrative Spins feature, a unique feature that allows players to pick between 5 different spin bonuses and receive 8, 10, 12, 14 and 16 bonus spins that offer winnings up to £64,000, £56,000, £48,000, £40,000 and £32,000 per line. Not only is So Much Candy Slots fun to play but it also offers so many winning opportunities that were sure it will soon become your go to game after a hard day.